watching Foul Play right now--this website is a great source of info, you really did your homework! Surprised at how much has actually not changed. Thank you so much, Tanja! Foul Play really is such a fun movie, glad you are enjoying it! have a suggestion for you--"Experiment in Terror" 1962. Much of it shot in SF. Fisherman's wharf, Twin peaks, some high school that I can't figure out (guessing Washington or Lincoln). Supposed to be a great car chase scene near the end--haven't gotten to that yet. Would love to find out what locations your sleuthing can reveal. Thanks again, Tanja! Experiment in Terror is definitely on my list of potential entries, so having an endorsement from a reader is a point in its favor. I'll have to check it out soon! Thanks so much for reading and commenting, Shadrias! Funnily enough, Time After Time just made my shortlist for movies I'd like to cover this year- you're probably aware that they're making a new TV series of this story this fall! I'll hopefully get an entry up around August or September, when new pilots start airing. Thanks again for stopping by! Hey Erika, I did NOT know of the TV series...err...I wish all involved luck and simply hope it generates interest in the Nic Meyer film. I still remember sitting in a theater back in '79 as an 11-year-old about to watch whatever flick I was there for when the trailer came on. Blew my little mind. HG Wells + Jack the Ripper + SF = When does this film release? You have all my faith in covering it, too. You're a true pro. Talk to you soon enough, cheers! I just discovered your website and really enjoyed your review of Foul Play! I have a borderline obsession with that movie. I live in the Seattle area, but during San Francisco visits I have enjoyed finding various Foul Play filming locations. You have given me lots of new ideas for locations to find on future visits. Great work! Thank you very much, Jim! I'm so glad I could give you some new tips for your next trip down here. Foul Play was recommended to me only a few months before I watched it for this entry, and it turned out to be one of the best recommendations I've ever received. Glad you enjoy it, too! Thanks again for reading! love, love the work you did. This page is tremendous. I watch this movie every month at least once. I know every piece of dialogue. And I love San Francisco!!! Thanks again. Jack, you flatter me! Thank you so much for the effusive praise. I'm so glad this movie seems to be enjoyed by so many! I'd never even heard of it until a few months before I wrote this entry, and I owe a huge debt of gratitude to the friend who recommended it to me. Thanks for reading! I am incredibly impressed by your work here! Strangely enough, I just returned to Texas from a visit to San Francisco during which I went by some of these locations - including Gloria's home on Vallejo. Have they redone the front door? In the movie it looked like a single door but now it looks like two doors side by side. Also, what are your thoughts on the film...? Did they actually shoot Gloria's home in the actual apartment? Thanks so much, Nick! Glad you enjoyed your visit and saw some of the filming locations. You raise some good questions about Gloria's home- although it's been about a year now since I watched the film, I do distinctly remember thinking that the view out the windows from the interior of Gloria's apartment did line up with what you would see out the windows of 430 Vallejo (or 428/432 Vallejo, since 430 doesn't actually exist). So I yes, I do think they may have actually filmed interior shots in that apartment! As for the doorway, that's a tougher question. I can't recall if the film featured one or two distinct doorways. As you probably saw yourself when you visited recently, the actual structure has a single archway immediately facing the sidewalk steps, and then inside that little alcove there are two separate front doors for apartments. 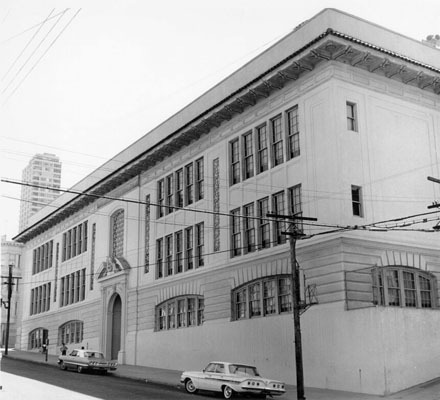 Of course, with housing being the way it is in San Francisco, it's entirely likely that in 1978 there was only one entrance, and that construction has added another door and/or apartment in the 38 years since. Sorry I don't have a clearer answer for you! I could go check at the Dept. of Building Inspections but that place is essentially the Terry Gilliam film Brazil, so I'm not likely to come up with answers there, either. I'm actually revisiting that block with my upcoming August 2016 entry- Gloria has yet another neighbor! I'm sure he won't be her last, filmmakers really love that area. Thanks again for reading, and for visiting San Francisco! Thanks so much for your hard work getting the photos of 2015... it's fun to compare. Just saw Foul Play again last night for the first time in 30 years. The archbishop's 'palace' is probably intended to be in one of the leafy neighborhoods around Mt. Davidson, in the south-west of the city. When Hawn and Chase flee from there before embarking on their multi-car spree through San Francisco, they're seen descending Twin Peaks along Glenbrook Avenue, with the city laid out to the north-east, probably in an honorable attempt to reach the Opera House by way of Market Street. As we know, all credibility is soon abandoned as they hit every tourist spot and famous vista available instead of just heading straight for the civic center, but at least there's a general sense of where they're headed. Thanks Patrick for identifying Glenbrook Ave. as the street Hawn and Chase decend after leaving the Archbishop's place. I have attempted to find that scene location unsuccessfully using google maps, but now I know! It looks like the homes on both sides of the top of Glenbrook have been replaced in the years since the film. The opening scene of the movie also appears to be the same location showing the Archbishop's car coming up Glenbrook at dusk with the city lights in the background. You mentioned in the above guide for Foul Play, that you were not able to locate the exact location for the lunch meet up in the Fort Mason park. I do have the exact location, with photographic proof. Would you like me to send you the location and photos? Jeremy- I'd like to see those pictures. I walked around Fort Mason park once and wasn't able to figure out exactly where that location was. I'd like to check it out again next time I'm in SF. I apologize for not responding sooner. Shoot me an email address and I’ll be happy to forward the photos. This is the precise location of the scene in question.